Popular in Middle Eastern cooking, black cumin (Nigella sativa) are amazingly healthful seeds native to south and southwest Asia. The prophet Mohammed is said to have claimed the seeds from this plant could cure nearly anything. The seeds were even found inside the tomb of Tutankhamen, and are mentioned in the Bible. 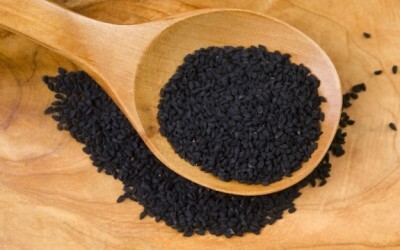 The history of black cumin as a healer is undeniable, with popularity of the seeds slowly returning. Black cumin is often used as a spice, but can also be found pressed into an oil for supplemental usage. It is said to contain several beneficial components (over 100 chemical components, according to Natural News) like conjugated linoleic acid, tannins, and antioxidants. It also contains vitamins, protein, folic acid, calcium, zinc, iron, copper, stearic acid, and several other compounds yet to be identified. As such, black cumin is an amazing immune booster. Null says it has the power to treat diseases such as cancer and HIV. But more applicable to the majority of people, it can help ward off some of the most common illnesses and diseases. Black cumin can be found in specialty stores, particularly health food stores and markets specializing in Middle Eastern cuisine. You can also find it online. Because there are substitutes for this spice, make sure you check product labels carefully. Vinay- black seed is known as KALONGI, an essential part of an Indian kitchen. Seeds and oil can be bought at the Indian grocery stores. Few drops of oil taken with a tea spoon of honey, after breakfast, looks after your immune system all day long. The author of this article is actually Maria Hurairah, also known as Barbi Trejo (google that name and you’ll see why she changes her name so much), Samantha Davis, Um or Umm Hurairah, Sara, Mo123, and the Black Seed Expert. She has a contract with Hemani, the company that sells the cheapest oil available anywhere on the Internet. It is not pure black seed oil, it’s watered down with some kind of vegetable oil. They won’t admit what kind they use, likely because it’s of a very low quality. Maria/Samantha then sells this oil at a 300% markup, making it about the same price as quality, pure black seed oils like Amazing Herbs and others. The whole point of this article is to push you towards her products. Notice how she keeps linking back to her own websites, where she sells her crap oil at insanely high prices. Black seed oil is an amazing product but do yourself a favor and get your oil from someone reputable. Get pure black seed oil from a certified organic distributor. You are a liar and an idiot. The author of this story is not Barbi Trejo. Give us a break. Hemani sells black seed oil for $25 a bottle and so does Maria. The difference with Maria is she provides free shipping anywhere in the world if you buy 4 bottles. It is pathetic to see you on this reputable website. I can only hope that Anthony removes your comment and throws it in the trash with the rest of your nonsense. I have taken black cumin oil many times and sad to say, I have never experienced any of the much touted virtues. Even the weight of research papers – 450 peer reviews and religious claims did you say? – has done nothing to overturn this simple personal experience. The writer linked to my article on Natural News using much of the information and like many these very short articles are not enough information. I have written 4 books on the subject and yet find that there is not enough information in those either. Black Cumin, Also known as Nigella sativa was sent as a healing agent for the world and I am thrilled that finally many of the top websites are recognizing the potential. Not only is knowledge important, such as dosages, warnings,etc, you also need to know where to purchase the best products. I have dedicated my life to informing more people. I have 2 articles waiting to be published on Natural News now and for some reason they are still waiting. So until that point I work on my multiple websites on Nigella sativa (8) spreading the word. The links I listed are just the beginning of what is available. I am contacted all the time about people having cancer and wanting to live. Without more information, more will die. So even today I am opening website number 9 with more information. For anyone interested you can go to my website and join my newsletter signup and keep informed, follow the links above. yes, agreed. thank you for mentioned I didn't know the benefits, i knew it by nigella seeds (and I thought they were mostard seeds..). Many of the spices we have today are ancient European, Asian, African or American. and many are very good as health remedies. I agree that mixing food and religion don't go together but in this comment, it was just informational of the origen where it came from and when, like when we mention Indian spices etc. of course most of the time in this case is not mention religion. The point is, that these seed are very good for you. NOW MY QUESTION IS, i just read some where (I can't remember where) that LINOLEIC acid is not that good for the heart. and that recently they found omegas6 is not good either… any ideas or info. on this? Or am I wrong? yes all these omega 6 oils are bad for health as they push your body into an inflammatory mode,a state that you do not want to be in….processed food is made with these oils so avoid,but you need a certain amount in your body so that natural inflammatory action can take place when damage or infection needs to be cleared….always balance omega 6 intake with omega 3…i use black seed oil all the time fantastic for skin eczema and sinusitis…..
By the way to correct a previous poster, Black Cumin Seeds (Nigelia ) history dates back to the Pharaohs of Egypt. It was used as a health aide since 3100 BC. A previous post gives credit to a person who was born in the year 570, it wasn't Mohammed who brought Black Cumin into use, the Egyptians used it over 2500 years earlier. Check your facts please. she didn’t say that prophet Mohammed brought black cumin but rather that he mentioned the benefits of it. I like the natural society. I didn't like the comment section here. I work with herbs and oils, make natural products, I lecture and some may consider me an "expert". But I won't toot my own horn and profess i am an expert, or link to my page, I won't mention my religion. There are over 20 different religions in the world, and some who have none. Let's keep self promotion off of this site. Just my opinion. I understand your point regarding linking to sites and religion but I for one, a Naturopathic Doctor, am grateful for the information. Let's all support each other in the world of natural medicine. Further, much information can be reaped from different religions regarding natural medicine and herbs. The Bible is a prime example and the Koran has gold nuggets of medicinal information. Patrick Moore, N.D.
Great info but funny mentioning religion in relation to the health & well-being of ppl. Religion & its war-like, anti-human rights reps aren't exactly what I have in mind when I think of my health & well being…rather hypocritical to utilize ridiculous scripture & hateful religious figures as exemplars of our health…there's just no need to mention it. Good article otherwise. This article made plain that it was talking about the history of the cumin and the healing ability. It was not ADVOCATING any religion. You might not like religion, but that doesn't mean that it doesn't exist and isn't a part of history, even as might effect natural food items. I found the WHOLE article interesting.